I went looking for The Clewiston Test at my local secondhand shop, but the only Kate Wilhelm I found was this one. It was short, and inexpensive, so I decided to give it a go. 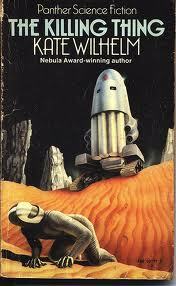 On the face of it, this is a story about a man and a robot, the latter trying to kill the former, on a desert planet. At the start I thought it was going to be one of those novels that would have worked better as a short story – even at only 142 pages, I wasn’t sure the whole being-chased thing was going to have legs (ha, ha). That was before the man, Trace, started having flashbacks… and everything changed. The flashbacks filled in his own back story and that of the robot, giving a much larger context than I had anticipated. Interestingly, Wilhelm also gives the robot its own flashbacks, which disrupts the readers’ instinct to identify solely with the human protagonist. This is a brilliantly written piece : sparse details, appropriate to the subject matter, with Wilhelm deftly conveying the increasingly feverish experiences of Trace frighteningly well. She also does a fascinating thing in creating layers throughout the book: Trace revisits several key moments several times, and each time some new nuance is revealed to the reader, eventually building up to a full understanding of just what is going on. The emphasis throughout the book is on the robot as a ‘logic box’ – its portrayal throughout is quite a different one from those found more recently, I think. The narrative only skirts around the issue of whether the robot is sentient, and what might be done if it is. Rather than dealing with this — and this is a slight SPOILER — Wilhelm is more interested in slowly, subtly, and cunningly making the reader aware of the fact that, being the well-trained soldier that he is, Trace himself can more than adequately be described as nothing more than a logic box. When I finally realised what Wilhelm was doing there, I both couldn’t believe I hadn’t picked up on it sooner and was terribly impressed with how skilfully she’d pulled it together. The other really fascinating thing going on in this novel is its discussion of colonisation and the attitudes that colonisers bring to new places. In this case, it’s on a galactic scale, but the attitudes and issues and words and problems are all completely identifiable from the last century or two right here – and I do mean here, in Australia, as well as in the wider world. Some of the words she puts into the colonised’s mouths are uncomfortably familiar, which I’m sure is the point, and impressed me given the time at which it was written; I hadn’t thought those sorts of things were being articulated in the 1960s. I had initially worried that the book would glorify war and the military, and it seems to indicate such a stance in the first few pages. However, by the end the book it’s clear that Wilhelm is indicting both war and the apparatus that supports militaristic attitudes, and when I realised that it was written in 1967 – well, it seems clear to me that this is an anti-war, anti-Vietnam piece. Perhaps that accounts for its lack of awards; I find it hard to believe it didn’t get any. This is a really, really, really good book.